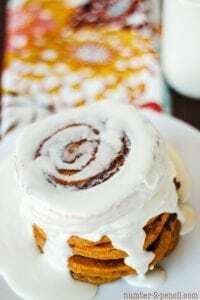 I’m so excited to share this super decadent and delicious recipe for Sour Cream Cinnamon Roll Pancakes, with a Maple Coffee Glaze. I’m a big fan of fun pancakes, and just like my Pancake Pops and my Pig in a Pancake Pops, this is a very fun recipe. In fact, breakfast just might be my favorite meal to make! 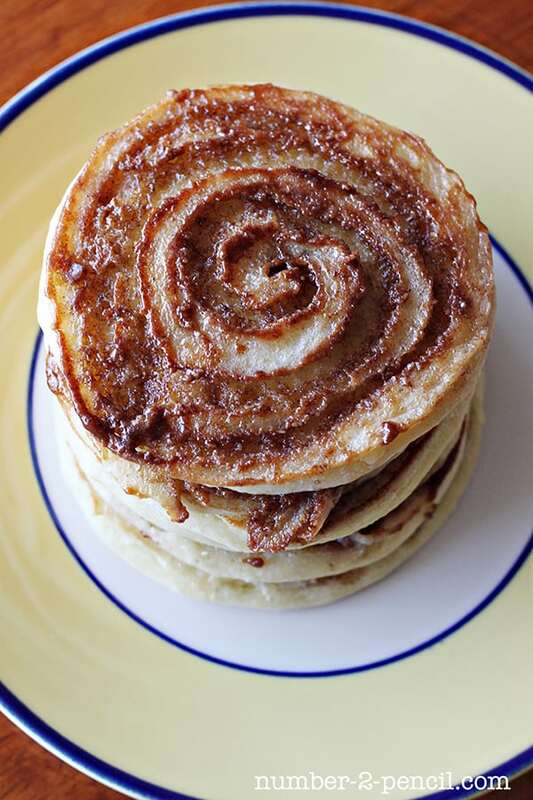 Sour Cream Cinnamon Roll Pancakes are a tender fluffy pancake, swirled with buttery cinnamon and sugar, finished with a maple coffee glaze that is to die for. 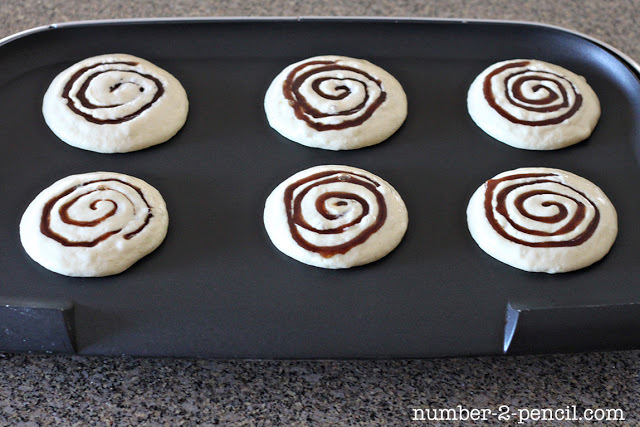 Let’s start by making the cinnamon filling, this way it has a chance to cool before going into the pancakes. Melt 4 tablespoons of butter in the microwave and add to mixing bowl. Then add 1/4 cup of dark brown sugar, 2 tablespoons of white sugar and 1 teaspoon of ground cinnamon and stir together. Let the pancakes set up on the griddle for about 2 minutes, then it is time to add the cinnamon sugar swirl. Snip just a small corner of your cinnamon sugar baggie. We are going to use the baggie like a pastry bag to make a swirl in the pancake. To make the swirl, push the tip of your baggie into the batter, and carefully swirl the mixture into the pancake batter. Don’t just swirl the mixture on top of the pancake, it needs to be in the batter to make the signature cinnamon roll look. Oh my, this looks so amazingly good!! I love cinnamon and adding it to pancakes is genius! Oh YUM! I might try these w/ plain greek yogurt. I’ve been using it in my pancakes to get some more protein in there. Totally pinning! 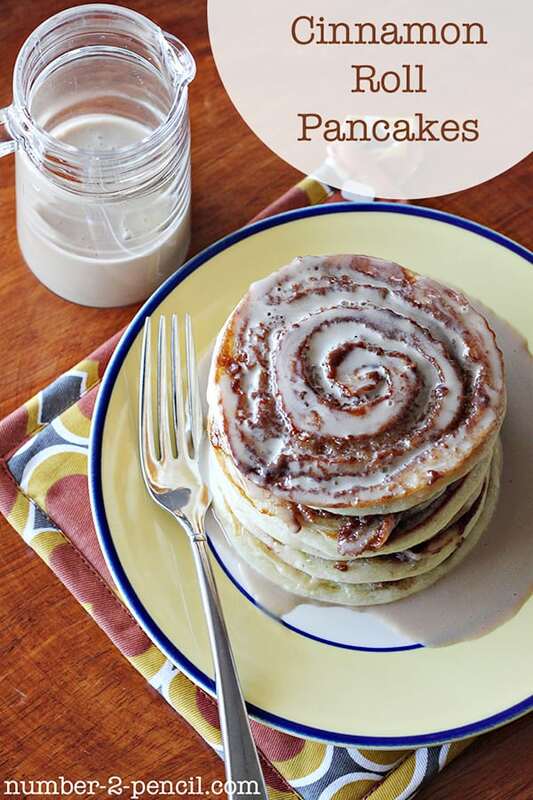 Pass me a napkin I’m drooling……….cinnamon and pancakes YUM!! Those look awesome! Right up my alley!! such a fantastically creative & super delicious recipe! Your pancakes look so delicious! I’ve been wanting to try these, now I’ll really have to try them! I can just smell the wonderful cinnamon…..! Yum!! Oh how I love this! Definitely trying this sometime! You, my dear, are a genius, my niece and nephew are going to be coming to stay with us, I will have to surprise them with this one. Thank you for sharing, I am a new follower!! oh my yumminess. i need these this morning! i’d love for you to come link this post or anything else you want up to my weekend link party http://www.lovenotesbylauryn.blogspot.com/2012/06/spread-love-link-party-14.html have a great weekend! 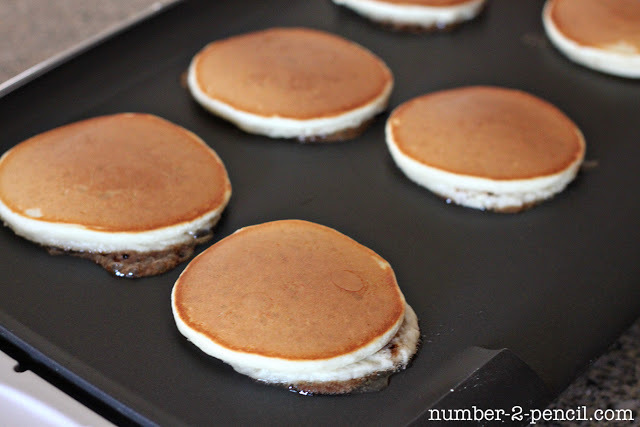 I love pancakes and coffee and maple and brown sugar… these are awesome! I hope you don’t mind that I shared your recipe on my blog today! Thanks! 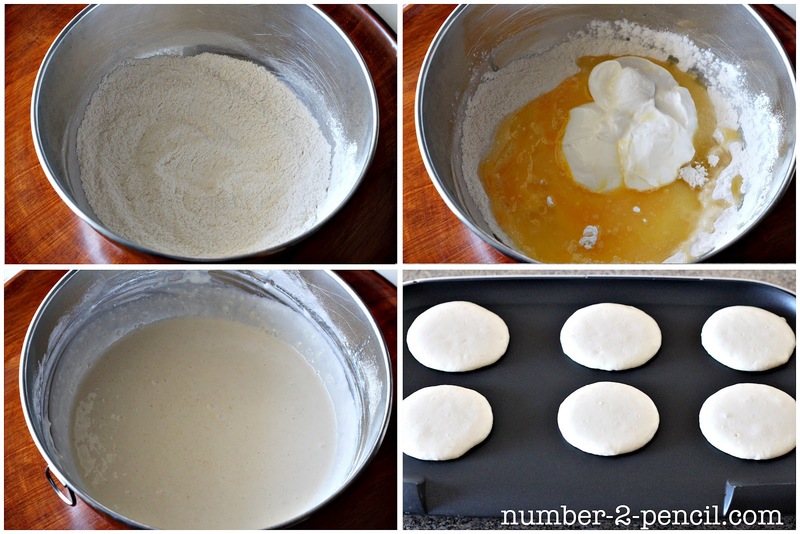 Your pancakes look so delicious! I just saw this on pinterest, and wanted to drop by to let you know how delicious this looks! We often like casual ‘breakfast for dinner’ meals on Sunday evenings at my house. This is a definite must-try! I found this recipe on pinterest, and made them for my family this morning. Thank you for this amazing recipe! You are so right, the glaze is life changing! Holy yum! 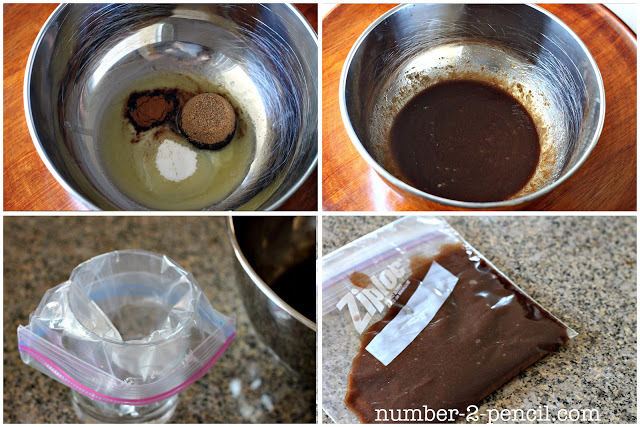 Just found your blog, and then this recipe…and I think I’m in love! 🙂 Can’t wait to try them. Just started following your blog too. Oh Yes…this looks and sounds heavenly! 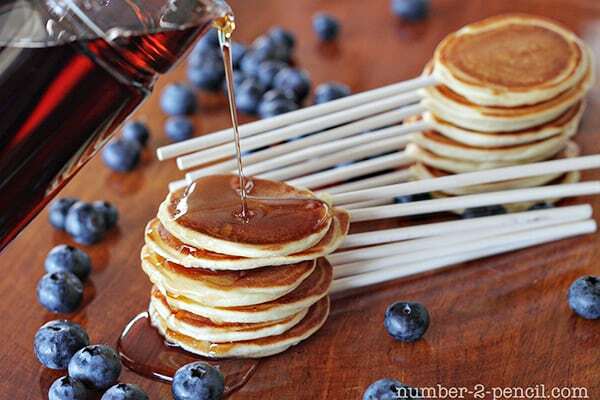 These look so yummy and special occasion breakfast. I wonder if you could make and freeze. Looks like a breakfast buffet to me. Oh yeah! Those look awesome! Oh, my word…they do look so amazing!!! I want that whole plateful like now!!! I will have to try those for my kids!!! Oh Melissa! These look heavenly! I am pinning this one sister… Oh yummy! I am making these this week. If we don’t drink coffee, is there something we could use instead for the glaze? Thanks! You could make any kind of glaze! Just use the cream, and skip the coffee! We made these for Mother’s Day and they were amazing! Now I cannot go without mentioning the level of difficulty to make my pancakes look like the picture. We burned the first batch but even after scraping off the burned side they were still probably the best pancakes and likely the best cinnamon roll flavor I’ve ever eaten. Will make these again and again. They were slightly gooey like a cinnamon roll. I made mine with cottage cheese & vinegar instead of the sour cream. Thank you! To make the swirl: Do I start in the center first and work my way out near the edges. Yes, just start in the center and swirl out. Make sure you push down into the batter a little bit too! 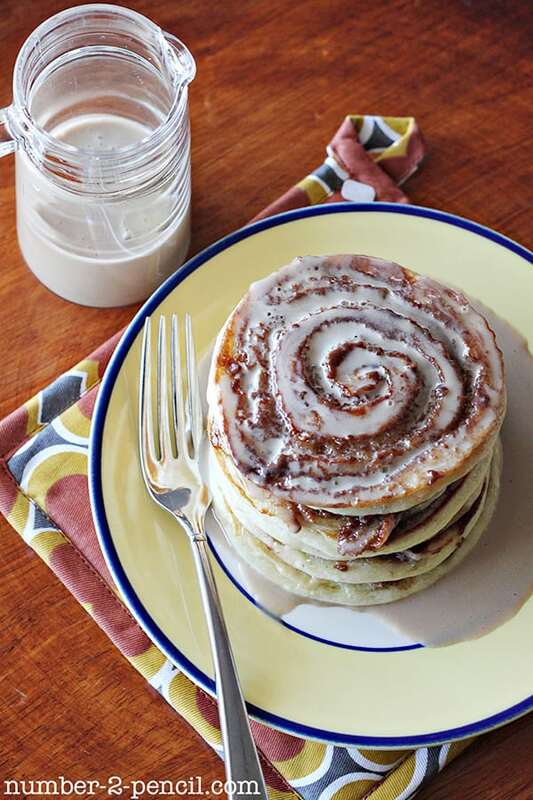 Luv these cinnamon roll pancakes. What a great idea and they must take fantastic – looking forward to making these! These are delicious! I used my own pancake recipe and added the swirls. They were a bit tricky, but after burning a few pancakes and putting down the temperature (and going through 3 ziploc bags) I got a great result. Next time I will try the glaze! It’s a George Forman nonstick griddle. I’ve probably had it for about 7 years and it still works wonderfully. I believe I originally purchased it at Target. What temperture do u cook the pancakes. Oh and these look so delicious. I made thes yummy pancakes today. I didn’t have enough sour cream on hand, so I used about 1/4 cup s.cream and 3/4 cup up vanilla yogurt. 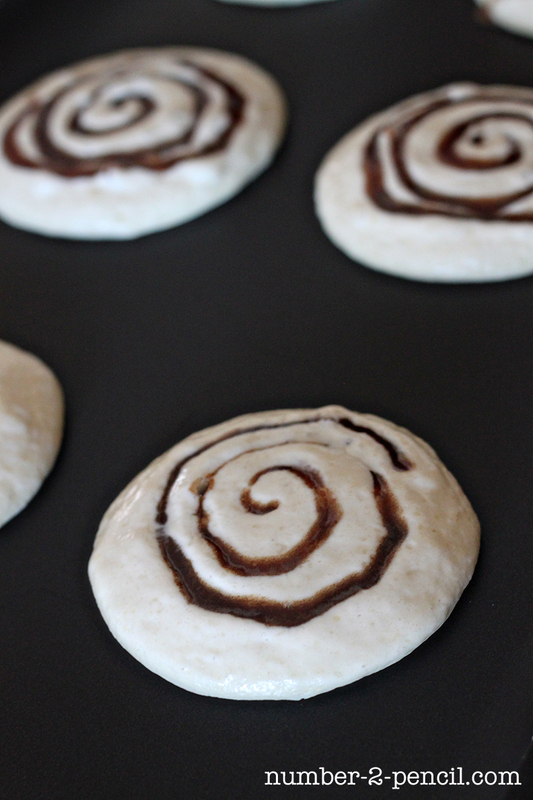 I did seem to think the cinnamon was really runny, and had a hard time getting the swirls. I got better as I went along but never got them to look lik the pictures. They were so good that I am sure I will have some practice swirling in the future! is the sugar cinnamon filling supposed to be liquid (i.e. the sugar melted?). When I mixed it together, the sugar did not melt even though the butter was hot, and the result was a clump of sugar soaked in a butter-cinnamon liquid thing so it was hard piping it. Try breaking up the clumps by massaging the bag to reincorporate the butter and sugar. I hope that makes sense! Pinned!! I just made a different recipe, so today’s craving has been satisfied but this is SO going to be the next one to try!! They look beautiful. Need to know if I can skip sour cream ? Will it make a vast difference to the taste? Has anyone made these and then frozen them? I’m thinking about making a big batch and freezing left overs.